To create a product, sign in to your Cart66 app account and visit the products section from the sidebar menu. If you have not yet created any products, you will need to click the button to add your first product. On the Basic Info tab, enter your information regarding your product. Name: Enter the name of your product. SKU: Enter a custom SKU for your product. Price: Enter the price of your product. On Sale? : If you would like to specify a sale price, enabling this option displays a sale price field. Shippable? : If your product will be shipped, enable this option and specify a weight. The weight unit can be changed under Set Up > Settings > Shipping Unit. 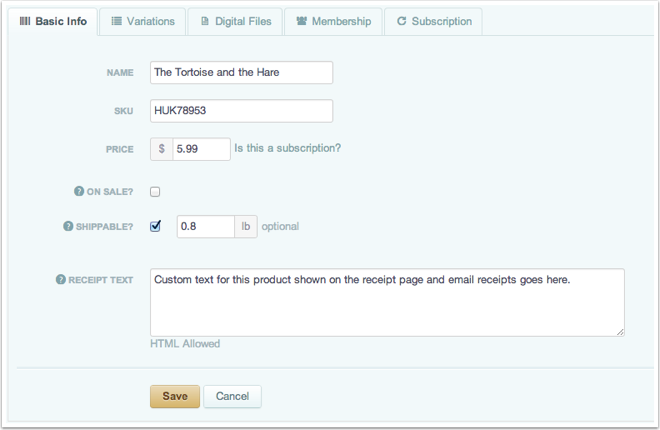 Receipt Text: Use this field to enter custom text specific to the product which will be displayed on the receipt page and emails. Click 'Save' to update your product's settings.